Gordon Mote, blind from birth, is one of Nashville’s most talented Gospel musicians. He’s a highly sought after pianist not only in Southern Gospel but also in secular country music. His latest CD, titled All Things New, showcases his abilities to sing and play in the country style, and proves that the style fits his voice perfectly. Gordon secured an impressive list of musical groups and vocalists to back him up. Gospel fans will recognize names like Voices of Lee and the Gaither Vocal Band, and country fans will recognize Trace Adkins, Josh Turner, and others that made special appearances. While no one would dispute the fact that Gordon is a talented musician, some may not realize that he’s also a songwriter. He co-wrote four of the songs on this project, including the upbeat country-style title track and the worship song "For You." I’m not sure which songs have been sent to radio yet, but I think a great pick would be "Down By the River," a catchy, upbeat tune, featuring the Gaither Vocal Band and Trace Adkins. I wanna have faith, I wanna have faith like that. "God of New Beginnings" narrates a story that’s sadly common in today’s culture. A man and his wife, separated. A marriage that’s all but ended. The first verse is about the wife who’s been left to raise three kids alone. The second verse about the husband who’s sitting in a parking lot with a lot of regrets. It’s a beautiful message of redemption and reconciliation. It’s almost a five-star song if not for the chorus bridge which I think is a little cheesy. "The Main Event" has to be the most unique song on the album. One blogger compared it to a Randy Newman song written for a Pixar film! It’s a fun, up-tempo, number that talks about how the "main attractions" of this world are hardly ever the "main events" that God has planned. The verses give a whole new perspective to the story about the women at the temple who gave all she had and to the story of Caesar who "built an empire from shore to shore." There are a few moments from All Things New that fall a little flat. For example, "Sound a Dream Makes" is too sentimental for me. "Do You Believe in Love" also finds me hitting the skip button. But overall, the album is definitely a must-listen. 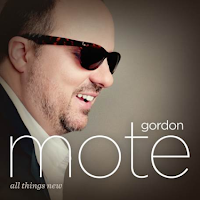 From wild country-infused tunes and upbeat Southern Gospel classics to powerful anthems and tender worship songs, Gordon has proved through the years that he’s not limited to singing just one style. And this album proves that he can do country just as well as everything else. If you like country-style music, you’ll like All Things New.